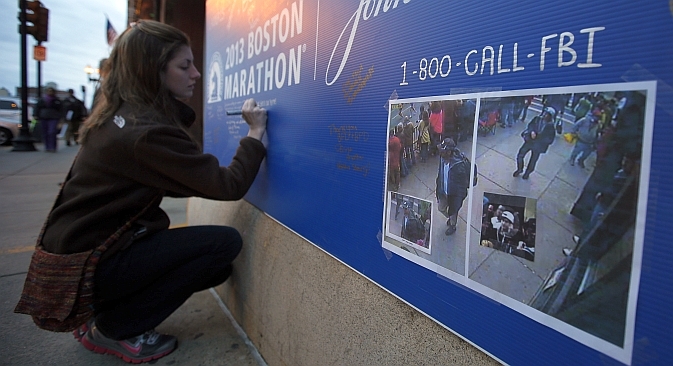 Following information about the Russian origins of Boston’s suspected bombers, pundits pointed out an apparent lapse in America’s counterterrorism priorities. On Friday it was revealed that the two main suspects in Monday’s deadly Boston bombing - Tamerlan Tsarnaev, 26, and Dzhokhar Tsarnaev, 19 – had roots in Russia’s restive North Caucasus region. The two had apparently spent time in Chechnya before living in Kazakhstan and traveling to the United States with Kyrgyz passports. "According to preliminary information…the Tsarnaev family moved many years ago out of Chechnya to another Russian region," press secretary of the Chechen President Alvi Kamirov told Russian news agency Interfax. "After that they lived for some time in Kazakhstan, and from there went to the U.S. where the family members received a residence permit. Therefore the individuals concerned did not live as adults in Chechnya." Vladimir Evseev, Director of the Center for Social and Political Studies, doesn't rule out that the Tsarnaevs may have orchestrated the Boston Marathon blast. At the same time he argues that terrorists’ origins don’t tell anything and terrorism is a global threat that need to be addressed. “Terrorism has no face and those who commit terrorist acts have no nationality,” he said.“For example, some Russian passport holders have joined the Syrian rebels. These are people without a true homeland. They earn money by killing people, and cannot change their occupation. ... [Potential] terrorists may come from elsewhere." Alexei Filatov, retired KGB officer and Vice-President of Russia’s elite Alpha Group Veterans’ Association assumes that the Tsarnaevs may have been brainwashed. “This will serve as a justification for any additional security measures the government takes, including military intervention abroad, directed at fighting radical Islam,” added Filatov. Yet Evseev argues that the government should be more careful when it hosts foreign citizens with different backgrounds. "Instead of sending troops to the Middle East to fight hostile regimes, America should focus on problems within its own borders,” he said. Russian presidential press officer Dmitry Peskov believes that the information about the suspects in the Boston terrorist attack should be verified. "All this information needs to be checked," he told Interfax. "We are giving close attention to all information we get from the media. I can't say anything now as to whether there was any information exchange through the special services channels."